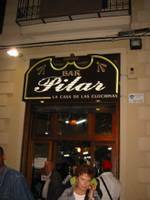 On our first night out we went to a traditional Spanish bar called Bar Pilar which was recommended by several travel guides. Inside had an rather 'old' feel with tiled walls and dark wooden furnitures and fixtures. 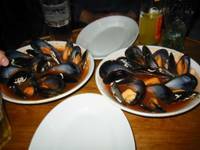 It is noted for its mussels rather than for the drinks. So of course we ordered 'dos enteros' two mussel starters. They came out as soups (see above right; click on it for a bigger picture). Now I'm not fond of mussels, I do eat it but I do't go out of my way looking for it. But one taste of their offering and I knew why this place is highly recommended. The mussels were one of the most delicious and freshest I have ever tasted. I was raised in a fishing village so I know my seafood. Even my vegetarian colleagues were encouraged to eat more than one mussel. The soup, which you ladle with the mussel shell, was perfect - a little salty with a taste of the sea and just a tad bit of paprika for some spiciness. Very very good! Now I will try that paprika thing next time I cook mussels. The same night we had dinner at a restaurant where we had two enormous pans of paella. 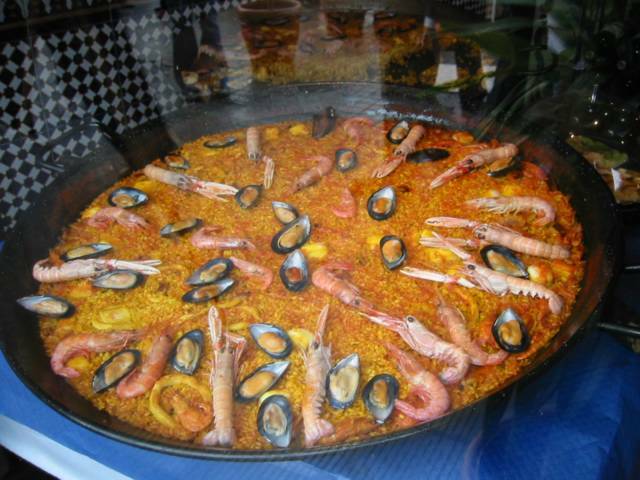 Valencia is regarded as where paella originated. 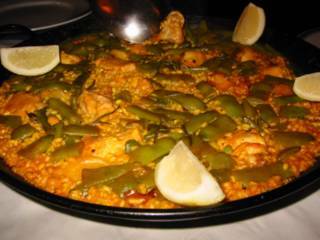 The traditional Paella Valenciana (PV) above is made up of rice, rabbit and/or chicken, snails, broad beans, and veggies. 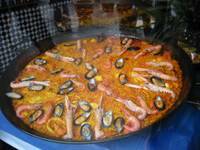 That was a revelation to me, I thought PV is full of seafood which is actually called Paella Mariscos (PM) [see below]. 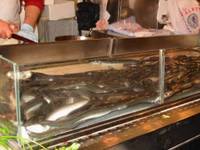 The PV we were served only had chicken which was okay since my colleagues probably do not want to eat Thumper. It was all right but there was a marked difference in taste with the PM. The PV was a lot blander than the PM but still quite tasty. So you could jst imagine how good the PM was. Lovely shrimps, tender mussels and squids. A reader in my other blog was asking the difference between the authentic Spanish paella with the Filipino version. I guess for me the main disparity is in the rice. In the Phils. we use the 'malagkit' glutinous rice or combination of glutinous and regular rice. Among other western countries they use long grain rice. 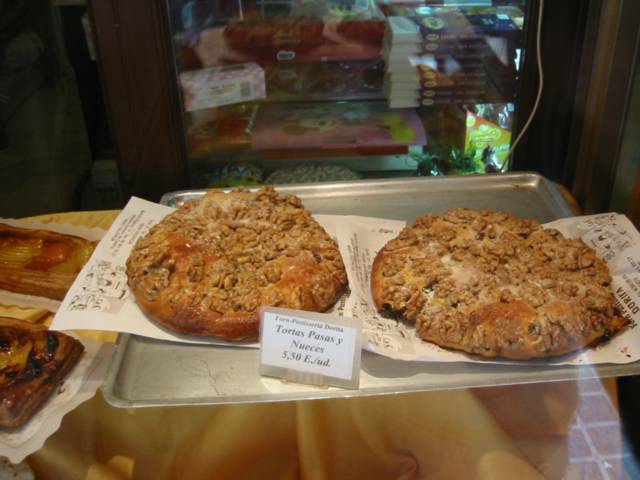 In Spain, they use the medium grain type that looks short and plump. Paella rice varieties include calasparra, bomba, and granza among others. 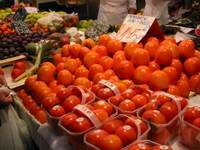 Also the Spanish version do not use so much tomato. We do it in the Phils. probably to make up for the colouring due to the fact that saffron is not grown in the Phils. and thus quite expensive and therefore, rarely used. For me the Spanish rice is best for paella because the rice is supposed to be just a bit creamy (though not as much as risotto) with the grains clinging to each other but not sticky or mushy. Now that you can't do with long grain or glutinous or Jasmine rice. On with the travel ... next day me and a colleague went out of the hotel to explore the shopping mall next door. 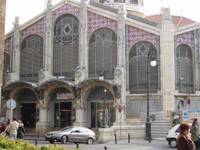 There was El Corte Ingles which is a relatively upscale department store. The rest are clothes and shoe shops and cafes. 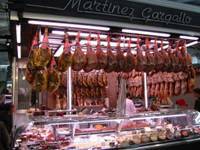 But rounding out around a corner was this ham shop (below left) which made my eyes bulge due to the wall to wall display of ham legs. OMG, loads of chorizos in the shelves (below right) I went gaga over this since back in UK, I get only one choice of chorizo in the deli counter. 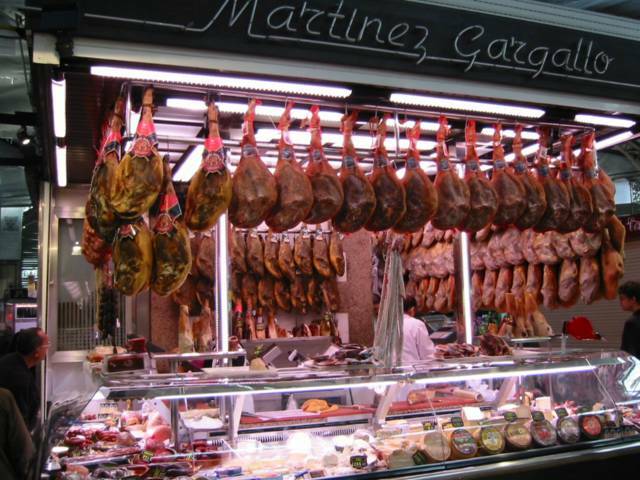 The more popular hams are the Jamon Serrano and Jamon Iberico. 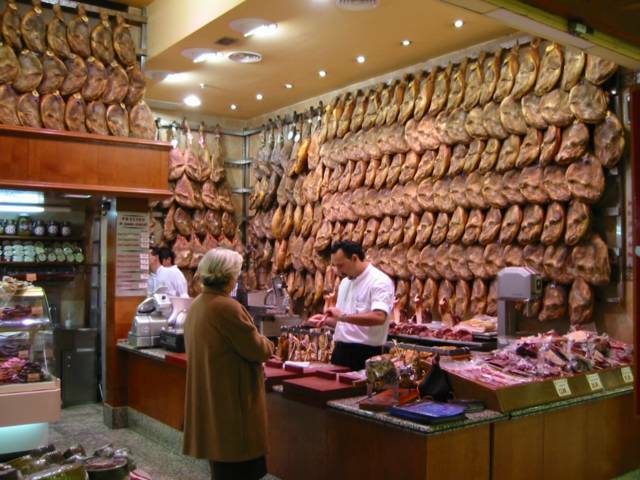 Both aged hams but Iberico is older (and wiser) and usually more expensive. 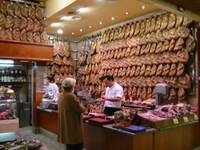 If cost is no object then go for the Jamon Iberico because they taste much better than the Serrano (IMO). 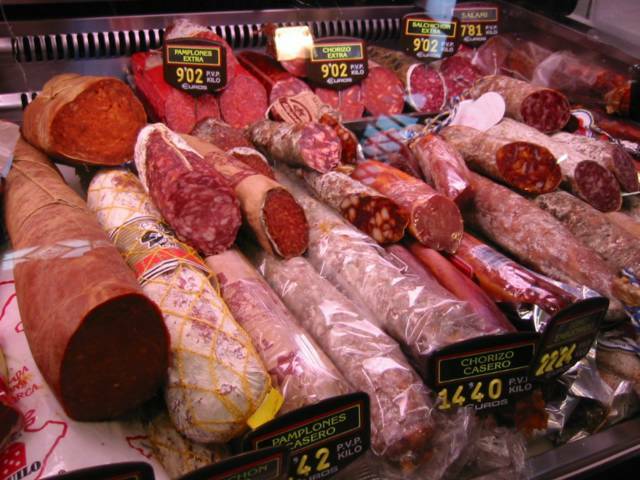 They are best served sliced very thinly and eaten as is with cheese (manchego goes well with it) and/or sliced baguettes. 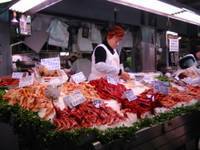 We then went to the old part of the city and visited the Mercado Central (central market) where I got so excited in seeing so many fresh seafood and produce at very affordable prices. 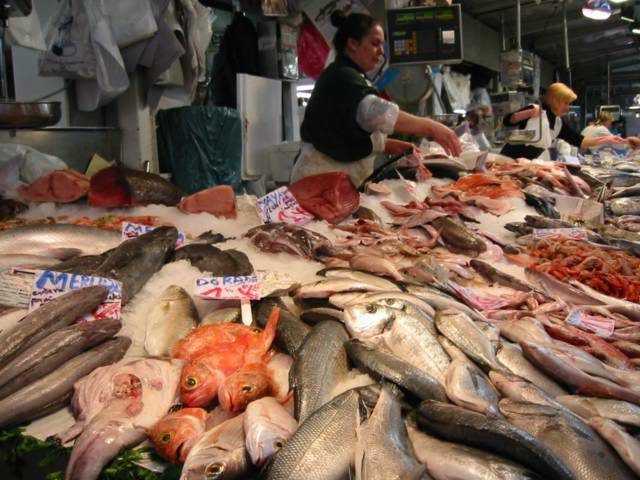 Above right are fresh fish in a fishmonger's stall; some of the fish's names are quite familiar. There are stalls exclusively for different kinds of shrimps (above left) although I could see that they are already cooked. Hmmm ... curious. There are live eels (above right). I guess they have to kill it first before giving it to the customer? There was even a stall for ostrich eggs and meat. 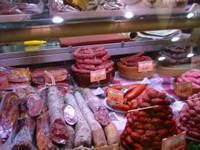 Of course, since sausages and ham are favourites around there, the market won't be complete without the ham shop. 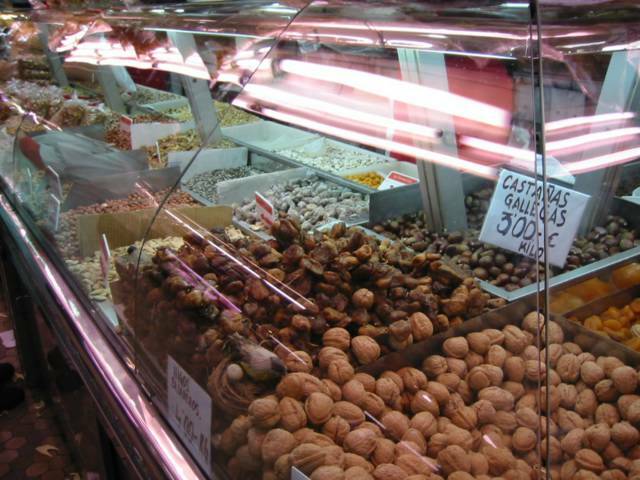 There were a lot of them that they occupy about a third of the market stalls. 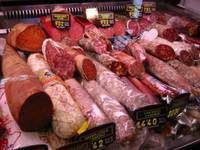 I bought several kilos of Jamon serrano, morcillas (blood sausage similar to black pudding), two types of chorizos, and of course saffron. I was carrying all these in my backpack while trekking on the beach promenade when we were looking for a place for lunch. After like an eternity, we came to a cluster of restaurants. We were so starved ready to devour everything in sight. I ordered this squid starter that was absolutely superb. 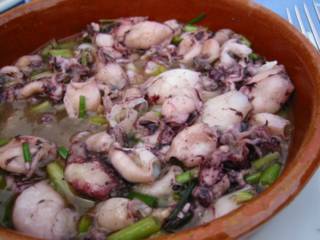 The baby squids were very fresh and tender which were simply cooked in garlic greens (talbos ng bawang), olive oil, and some seafood stock. I really enjoyed that. My other companions who ordered steaks were not impressed at all. Oh well, I guess their specialty is really seafood. 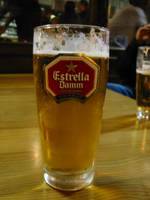 On our second night, we had several rounds of beer and some tapas in a small bar (all the bars here are small). They served us excellent Jamon Iberico - thinly sliced, slices of Manchego cheese, and potato-venison croquette. A collegue was joking that since we didn't have Thumper we might as well have Bambi. :) We went onwards to a Colombian restaurant but it was full to the rafters. So we managed to get into a grubby looking small cafeteria. It looks like a lorry drivers cafe but the food was good and the manager/waiter/cook was very accommodating. 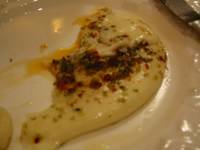 He served us some baked soft cheese dish (which suspiciously looked like mozarella) sprinkled with herbs (above right) and some empanadas. Our bellies full, we hit the clubs and bars. In all of them, the drinks were cheap compared to London prices and they were very generous with the spirits. Say for example rum & coke, in London the rum would be poured up to only an inch from the bottom. In Valencia they would pour it 2/3 way up! Hardly any room for the coke! 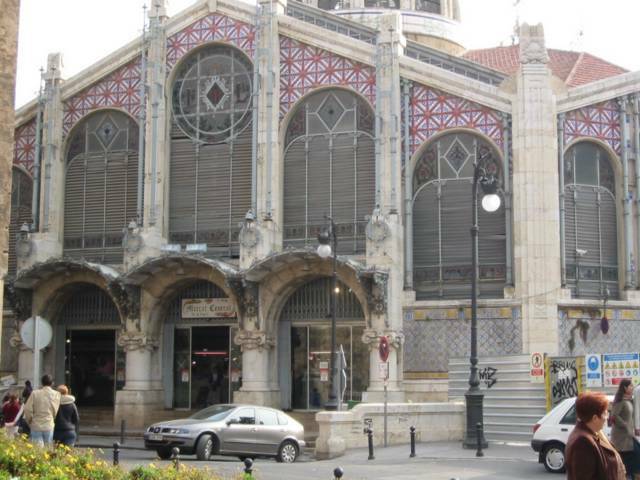 The next day was our last, so we went seriously sightseeing in the old city again. Lunch time we settled for outdoor seating in a restaurant. 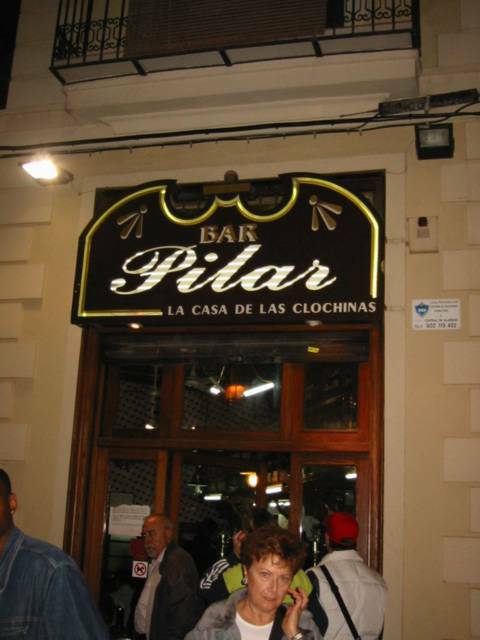 They had these enormous pans of paella in their windows (above left). I thought they were displays only. Turns out they get their serving from those very pans and reheat them. Oh my gulay! I didn't know that even in the land of paella the quality would vary greatly. 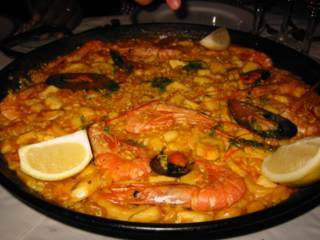 Nevertheless, me and a colleague ordered arroz negra, it's paella with seafood and squid ink thus the black colour. Our other companions were so grossed out making us smile to see our blackened teeth (heh inggit lang nila!). But it was very tasty actually. They also serve paella with aioli on the side - they can be quite garlicky strong - phwoar! 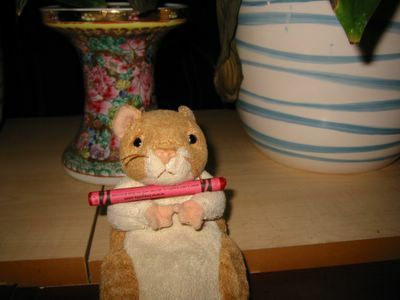 I had to chew some gum to reduce my bad breath!